جان رابرت بولتون اینگیلیس دیلی:John R. Bolton) (دوغوم:20ی نوامبر 1948 بالتیمور) آمریکالی سیاستچی و وکیل دیر.9 آوریل 2018ده آمریکانین میللی امنیت یاردیمجیسی اولدو و آمریکا بیرلشمیش ایالتلرین جومهوری حزبیدن سئچیلیب.2005-2006 جی ایللرده آمریکانین بیرلشمیش میلتلر گوونلیک شوراسیندا سفیرایدی. آمریکن اینتر پرایز انیستیتیوسی و فاکس نیوز کانالی و یونسا تشکیلاتی ندا عوضو اولوب.آمریکانین عراقا یوروماقیندا یاردیمجیلاردان اولدو و ایران ایله محاربه سالماق ایستیر. ↑ PN690 - Nomination of John R. Bolton for Department of Justice, 99th Congress (1985-1986) (December 16, 1985). یوْخلانیلیبJuly 22, 2018. ↑ PN1250 - Nomination of Thomas M. Boyd for Department of Justice, 100th Congress (1987-1988) (October 14, 1988). یوْخلانیلیبJuly 22, 2018. 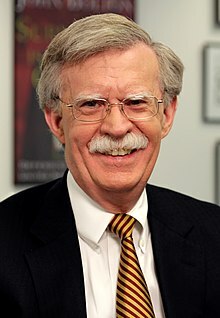 ↑ Ronald Reagan: Nomination of John R. Bolton To Be an Assistant Administrator of the Agency for International Development. یوْخلانیلیبJuly 22, 2018. ↑ Ronald Reagan: Nomination of Richard A. Derham To Be an Assistant Administrator of the Agency for International Development. یوْخلانیلیبJuly 22, 2018. ↑ Ex. Rept. 109-1 – The Nomination of John R. Bolton to be U.S. Representative to the United Nations with Rank of Ambassador and U.S. Representative to the United Nations Security Council and U.S. Representative to the United Nations General Assembly During His Tenure of Service as U.S. Representative to the United Nations. بۇ صفحه‌‌ سوْن دفعه ‏۱۴ اوْکتوبر ۲۰۱۸، ‏۲۲:۰۹ تاریخینده دَییشدیریلمیشدیر.